We've not gone barking mad – now your dog or cat can be fitted up with GPS collars and even fancy fitness tracking collars. Pet wearables are routinely forecast as big business, with an increasing number of companies crafting wearable gadgets just for animals. Trackers can also crucially monitor their health, looking for tell-tale changes in behaviour that point to illness, and keep tabs on their location if they go walkabout. We've rounded up some of the best pet wearables for cats and dogs below - whether they're focused on tracking location or health - complete with handsome four-legged models to show them off. If you want a smart collar that's dedicated to tracking the location of your canine, check out the options below. Some will handily tack on health monitoring, but all feature GPS and may even let you tap into the location tracking smarts to set geo-fences and alerts for your pooch's whereabouts. Boasting proper wearable tech pedigree (excuse the pun), Whistle is the work of New Deal Design, which also designed the original Fitbit Flex. 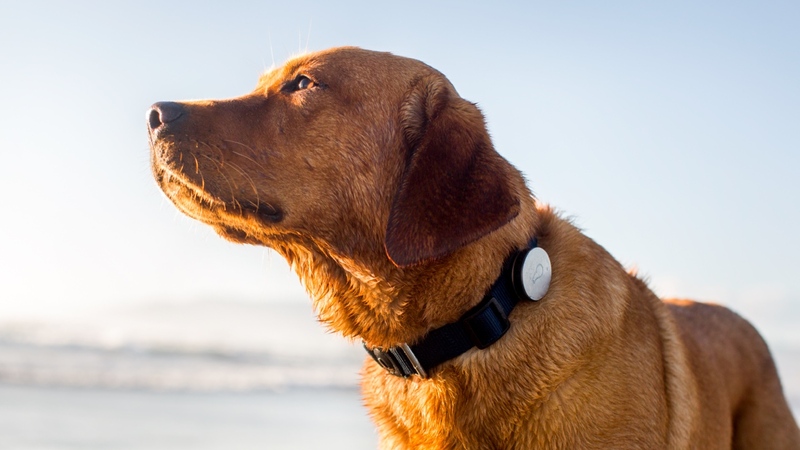 The device marries GPS tracking and pet wellness in one band; the unit clips to any collar more than an inch wide and connects to a smartphone app to keep tabs on your pooch's step goal. On the GPS side, you can get real-time location anywhere in the US and set up a geo-fenced area with alerts. The battery recharges in one hour and lasts around 10 days. However, on top of the price tag you'll need to pay between $6.95 and $9.95 per month for a data subscription. Telecom giant Invoxia has partnered with animal-centric community website Wamiz in order to launch the Pet Tracker for dogs and cats. It’s designed as a smart collar, with GPS location features, so personalised security zones can be defined within the app, while notifications can also be pinged if they leave the designated area. You'll then get their location pinged every three minutes, thanks to LPWAN, which means no SIM cards or data plans are required. The Invoxia Pet Tracker weighs 15g and measures in at 42 x 24 x 17 mm – so it’s not outrageous big like some rivals. What’s more, it’s IP67 water-resistant, so it will survive a quick dip. You get six months of battery life between charges, too – so it’s certainly less hassle than other smart collars, too. There is a subscription fee of $9.99 a year – a lot less than GPS subs – and Invoxia is throwing in that cost for three years, which seems a pretty decent deal. Sigfox coverage in Europe is patchy for instance, the Invoxia Tracker works in Ireland, France, Germany, Spain etc but not all parts of England and Scotland. You can check if it works in your area/country here. The Link AKC wants to be a stylish all-in-one solution for your best buddy. It can track your dog, allowing you to set up digital safe zones and receive alerts when they leave those zones. It'll also keep track of steps and let you know if the temperature is too hot or cold for your dog. Plus, it'll learn what kind of activity is actually an exercise for your breed. There's a sound that can be used to help train your dog however you want, and the collar also has a built-in LED light for walks at night. Also, it just looks good, which can't be said for all options out there. It can pair with any collar, or slot into Link's own leather collar. There is a subscription plan that ranges from $6.95 to $9.95, depending on how long you sign up for. The Xiaomi PetBit is a GPS collar, designed to offer peace of mind for your pet­ as well as Fitbit-style tracking of your furry friend’s activity. Weighing in at 26 grams and measuring 5.04 x 4.6 x 1.8 cm, the PetBit brings a IPX7 water rating, too, meaning it can survive splashes and rainfall but not full, prolonged dips in water – which is a little concerning if your dog likes to swim. But the key ingredient here is GPS. You can get a position lock for your pet via the app – and unlike rivals, there’s no need for a subscription fee. What’s more, if your pet is out with the tracker at night, a blue LED light will flash to give you a better visual in their location. If the worst happens, the QE code on the tracker will reveal your contact details if they’re found. Aside from location tracking there’s plenty of Fitbit-style activity tracking – with distance travelled, calories burned all tracked within the app. The app is always slightly problematic with Xiaomi products being a Chinese company, so while it is available in the US, there will likely be a few amusing translations thrown in for good measure. While the above options focus primarily on keeping you in the loop of your dog's whereabouts, the options below are more geared towards training or tracking your dog's health. Since they don't include GPS location tracking, that also means no monthly subscription fee. Pawbo's activity tracker - for both dogs and cats - weighs just 8g and it's very affordable too. It clips onto your pet's collar and tracks movement and sleeping with some fun, app based games too. It's a good gateway if you want to give pet tracking a try but you'll probably soon be moving onto some more polished and feature-rich. Essentially a Fitbit for dogs, PitPatPet boasts an entire year of battery life for keeping tabs on your dog's movement 24/7. As well as making sure that your dog is getting enough exercise, and check you're getting your money's worth from that expensive dog walker, PitPatPet will warn you of any changes in your dog's active behaviour, which can be an indicator that they're feeling under the weather. Importantly, PitPatPet is fully waterproof and compatible with both iOS and Android phones. Do keep in mind that shipping for this tracker is only available throughout Europe. Instead of GPS, which usually tethers in a subscription service, the Fitbark - now in its second generation - uses an accelerometer to track your dog. Targets are set once you input your dog's weight and breed, with activity, or 'Bark Points' contributing towards a daily goal. Another nifty feature of this wearable is its information breakdown, allowing you to see when your canine is taking part in rest, activity or play. As a result, you can see how your dog fares when you're not around. The battery life for the Fitbark 2 is roughly six months, with the 24-hour tracking giving you insights into wellbeing in the day and night and giving you a base make decision with your vet regarding your dog's nutrition and mobility, as well as any potential health conditions. While most pet wearables occupy the tracker department, the Delta Smart also happens to mix in some training capabilities. So, if you're the owner of an overzealous barker, Garmin claims the device's training system, which lets you use tones, vibrations and "stimulation" (which is essentially a friendlier way of saying "small electric shock"), will condition your dog's behaviour. You'll be able to look at the data over time to see which of the stimuli is most effective in correcting those pesky barking habits. Let's take some time to appreciate the cat, since most collars and trackers in the space tend to focus on dogs. Below are the wearables that are dedicated to tracking your feline's health and location, as well as some that are able to cater to both species. One of the only pet wearables that works for both cats and dogs of any size (well, 8lbs upwards, to be precise), the PetPace is a comprehensive health monitor. Because your furry pals can't tell you if they're in pain, this gadget tracks vitals such as temperature, pulse, respiration, activity, calories and posture, notifying you of any abnormalities. The data can also be accessed by your vet to keep your animal chums in fine health. The woven fabric colour bears more of a resemblance to traditional pet collars, too, rather than the rigid design seen on most smart collars. It isn't the cheapest option, with annual plans and collars starting at just over $150 and going all the way up to roughly $350 if you want lifetime cover, but this is certainly one of the more comprehensive options in the space. Built by GPS beacon veterans Loc8tor, TabCat is designed to clip to your cat's collar and help you find them if they get lost. Rather than connect to an iPhone app, TabCat comes with an RF receiver, which displays a nearby signal on a strip of LEDs and causes the sensor to beep – guiding you to your cat. It's nowhere near as advanced as something like Whistle, but it has its benefits. Firstly, it's small enough for a cat to wear comfortably, which is the reason that there's more GPS trackers for dogs than for cats. Secondly, you don't need to pay a data subscription. It should pick up a signal within 400 feet and, allegedly, you can 'train' your cat to return home when it hears the beep. London-based Felcana's Health Monitoring Kit has launched initially with a connected collar, the Helix (shown above), which focuses on gathering health reports of your cat or dog around the clock, alerting owners of any behavioural or physiological abnormalities and providing feedback through veterinary advice. Unlike any other option on this list, the Kit will also employ AI in order to help detect and predict the early stages of diseases, such as diabetes and arthritis. With this data also stored within the companion app, it can be used as backup for any vets looking to make a diagnosis on a pet's condition. Felcana states that more components are set to be added to the Health Monitoring Kit as time goes on, but this would appear to be a very strong way to keep track on the health of your cat or dog.